^ 2.0 2.1 Shaken or Stirred? A Short History to Celebrate National Martini Day. The Drink Nation. [2018-04-13]. ^ Taylor, David. Martini. Silverback Books.. 2002: 8. ^ 1887 The Bar-Tender's Guide by Jerry Thomas. cld.bz. [2018-04-13]. ^ Edmunds, Lowell. 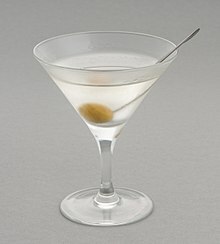 Martini, Straight Up: The Classic American Cocktail.. Johns Hopkins University Press. 1998: 81. ^ Johnson, Harry. The New and Improved Illustrated Bartenders' Manual; Or: How to Mix Drinks of the Present Style. H. Johnson. 1888: 38. ^ Gasnier, Vincent. Drinks. DK Adult. 2007: 376. ^ Thomas, Stuart. Stuart's Fancy Drinks and How to Mix Them. Excelsior Publishing House. 1904: 132. ^ McElhone, Harry. Harry's ABC of Mixing Cocktails. Dean & Son Ltd. 1922: 55. ^ Erica Elkhershi, Sumant Bhatia. Instant Expert: How to make a perfect martini. The Daily Telegraph. 2013-09-13 [2018-04-13]. ^ Bloom, Dave. The Complete Bartender's Guide. Carlton Books. : 95. ISBN 1-84222-736-X. ^ Colleen Graham. The Perfect Martini. 2018-02-16 [2018-04-13].